The topic can be played with some but needs to be close to what I have listed. The professor list this as a descriptive research paper describing what you would do when writting on such a topic. 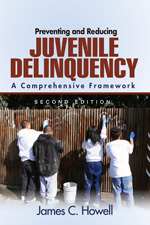 Paper topic: "Juvenile crime is more prevalent in lower class families then what is found in middle to upper class families"
Section II Research Paper Topic: The subject of the research paper must be applicable to crime, criminal behavior, the behavior of law, or criminology. Regardless of subject matter that is acceptable, the subject must be confronted from the social theorists perspective; utilizing appropriate theory(s) in the analysis of the subject matter; and unitlizing the appropriate research terms and principles. Paper that is designed as a descriptive presentation of an issue or event is not acceptable as a research paper for this course. The major focus of this paper is the expectations set fourth in section IV, next; and, these expectations must be confronted in depth, not as passing point of emphasis references within a nonresponsive essay. typed, one and one-half line spaced, with one inch margins, headers and footers, untilizing normal size fonts. Of a text length of not less than 12 pages or no more than 15 pages. (abstract page, statement of authorship page, Form G analysis page, charts, graphs, tables, endnote page(s), and/or bibliography pages are not considered text pages). Based upon a style set fourth by the University of Chicago A manual of style, the American Psychology Association style of publication, or other simular style accepted. Each page, except the title page shall have a header with the abbreviated title of the paper and the hand written initials of the author, and footer with the page number. C. Statement of Authorship and Release. Brief statement of the question/issue/problem. The importance/significance of the question/issue/problem. Specification/description of the research question(s). General overview of the boly(ies) of literature, with theoretically focusses and informs the study. Description of the specific and narrowly focused literature, which bears directly on the research topic. Relationship of the pertinent literature to the research topic. G. Analysis of the question/issue/problem being investigated utilizing theory(ies) of appropriate ot the research question and the research hypothesis. The outline for the research paper reflected above is a general guideline, the students specific paper may require some modification based upon the research topic. The purpose of the Analysis of the Question/Issue/Problem being investigated utilizing theory(ies) of this paper is the analysis of the topic and not a descriptive or topic presentation. Descriptive and topic presentations tend to create a set of seemingly unrelated analyses and findings, lacking any integration into comprehensive analysis of the topic. The focal point of this research papers is the analysis of the topic, not the simple presentation. Paper Masters writes custom research papers on Juvenile Crime more Prevalent and discuss an order placed on a project that provides a detailed example of how paper should be put together.